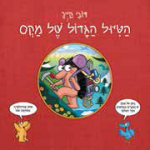 Everything in terests Max the porcupine – Who built the pyramids? Is there a monster in the Loch Ness? Where do poisonous frogs live? When Max receives a round-the-world plane ticket as a birthday present, he doesn’t waste a moment to start exploring the cultures he and his friends have always dreamt about. A unique and exciting book that combines charming comics with fun learning. Dovi Keich is a comics writer and teacher. He started drawing at the age of six and by the age of twelve had already published his first comics. His comics’ characters Arthur and Blu have been appearing for years in children’s magazines and have been developed into two multimedia games.